Our baby is coming soon 🙂 As a responsible parents, we talked about his future and planned for it. Most especially his education and how we can prepare. With our goal of retiring at 40’s, we need to find ways to make it sure that we have enough funds to support our child and send him to the best school for his learning. During my college time, I don’t have savings or money to support my education. I ended up as working student, working in the morning and studying in the afternoon till night time for 5 years. I still remember those days when I have to wash mountain of plates just to support myself in college. Most of my college professors knew me because they always caught me sleeping on class due to my tiring schedule everyday. Inspite of that, I finished college with high GPA. Those were the days and I don’t want my child to experience the same way. Let’s get back to our topic. 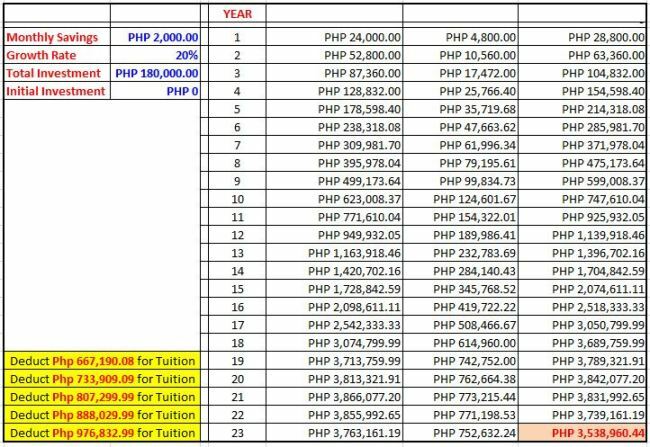 Currently, the average tuition fee in University of Sto Tomas is Php 60K. In one year, that would be around Php 120K. 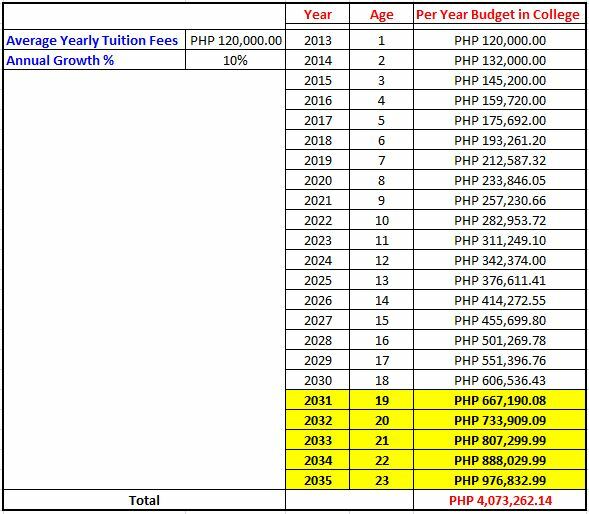 Annual growth of tuition fees in the Philippines is around 8% to 12%. 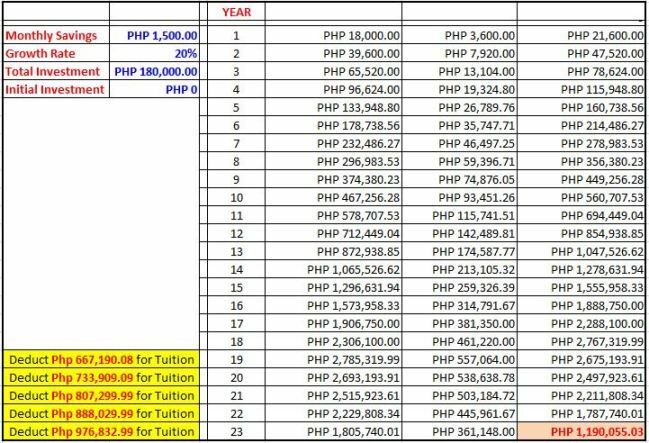 That means, when our baby enter college at age 19 (additional 2 years due to new K+2 law), that will be around Php 667,190.08. If he will take a 5 years course, that’s a total of around Php 4 million for his education. See below table for full details of the amount. In order for us to cope with this huge amount of college bills, we are planning to start invest at early age. Right after our baby is born(in a month perhaps), we will open a mutual fund ITF investment account for him. Base on approximate growth of our investment at 20% a year and continous monthly investment till year 23, we should be able to shoulder his college tuition fees and worth a million gift for him during his graduation. However, this doesn’t account other expenses like allowance, food and everything. To be able to cope all those extra expenses, we have to increase our monthly investment to Php 2000. Here’s the new computation. As you can see, there’s a big advantage if you start investing at early age. Compounding interest do its magic and make your money grow in few years. Even if we plan to retire at age 40’s, a monthly contribution of Php 2K won’t hurt our budget much. This is our plan on how to prepare his education. I hope this will serve as reference for you as well. Next: Compounding Interest: Friend or Foe? sorry, how did you get the succeeding years’ figures? that’s thru compounding interest. example, if you have 100K and it will grow 20% a year, after a year that will be 120K already. the next year, it will be (120K x 20%) + 120K…. what i mean is your table for computation of savings at 2,000 per month. sorry, i got it. how was I not thinking? thanks. Nice! I’m doing the same thing! We’ve already setup a fund for our 1-month old baby’s college education. Though when he gets to college, we plan to shift more towards bonds. It makes the timeline a little cramped, but we can’t afford to get caught in a bear market at that point. How did you come up with the 20% growth rate, btw? Stocks are usually around 10%… You can get as much as 30% or more, but usually that’s not over the long term. hi carlos. annual return is not guaranteed, it could be higher or lower. for Philequity PEFI fund, their average annual return for 10 yrs return is around 23.61% as of today 🙂 you can check on their website, 10 yrs earnings for the fund. Hi Richard, thanks pala sa seminar last jan 31. Meron na ako existing uitf sa bdo, advisable ba na mag open ako ng separate account sa same bank para sa education ng anak ko or sa ibang bank naman?